The new Welsh Butcher of the Year is Craig Holly, assistant manager of Neil Powell Butchers in Abergavenny. Holly, 29, added the coveted title to his list of honours, which include Welsh Pork Butcher of the Year in 2016, following a keenly contested final at the Royal Welsh Winter Fair in Builth Wells on Tuesday. Just a few points separated the three butchers in the high scoring final. Chris Lewis from Filco Foods, Llantwit Major and Jon Whittington, a freelance butcher from Welshpool, a late replacement for defending champion Dan Allen-Raftery, from Randall Parker Foods, Llanidloes, were runners up. Both Lewis and Whittington made impressive competition debuts. After being beaten by Allen-Raftery last year and being runner-up in the recent Butchery WorldSkills UK final in Birmingham, Holly was delighted to be named champion. Despite competing in the Butchery WorldSkills UK final less than two weeks ago, he completely changed his products for the Welsh Butcher of the Year. “I didn’t want to go into the competition to do something that I had already done,” explained Holly. “I prefer to challenge myself and everything I did was completely new. “Competing at WorldSkills UK has made me a lot cleaner as a butcher and I take more care with trimming bones. It has also given me the confidence to try new ideas. “I now plan to work hard to get through to the WorldSkills final again next year. My ambition is to travel and to be involved in new product development as a butcher. “Everyone has seen how to bone out a shoulder of lamb, but I want to come up with different ideas that show butchery as a craft. A younger audience wants new products that they haven’t seen before. 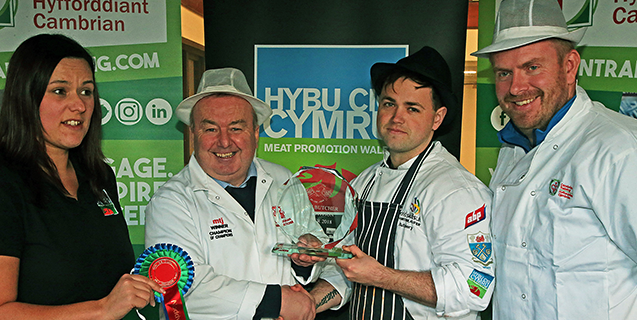 Sponsored by Cambrian Training Company, Hybu Cig Cymru/Meat Promotion Wales and the Royal Welsh Agricultural Society, the Welsh Butcher of the Year competition is an important stepping stone to UK-wide competitions. Holly will have the opportunity to follow in the footsteps of talented butchers like Peter Rushforth and Matthew Edwards, who both represented the UK and won the Butchery WorldSkills UK final. Chris Jones, head of the food and drink business unit at Cambrian Training Company, praised all three finalists. “It was a very high scoring final and all three butchers had a good work ethos – clean, tidy, methodical and skilful. The finalists faced a true test of their butchery skills over three tasks in front of an audience in the Cambrian Training Pavilion at the Royal Welsh Showground. They will be given an hour to seam a leg of pork, 70 minutes to create kitchen ready products for customers from a mystery box of ingredients and 90 minutes to create a visually exciting barbecue meat display using a whole chicken, topside of Welsh Beef, leg of Welsh Lamb and topside of pork. Craig Holly receives the Welsh Butcher of the Year trophy from judge Steve Vaughan watched by Kirstie Jones, Hybu Cig Cymru’s market development officer and Chris Jones, Chris Jones, head of the food and drink business unit at Cambrian Training Company.